In Room 111, first graders were still at work the day before their school was set to close. Principal Allen Mosley did not stay home from school the day he fell down the stairs at home. He showed up to school with a broken rib. "I was right here walking sideways with these students," Mosley said from the principal&apos;s office at Bontemps Elementary School. "There’s nothing like these kids here. We don’t know what we’re gonna do without ‘em." Today might be one of the hardest days of Mosley’s life. He says he&apos;s missed just five days of work since he started at Bontemps 24 years ago as a substitute teacher (he remembers the exact date: April 4, 1989). For 28 schools that Chicago’s board of education voted to close last month, today is the last day of school--ever. How do you shut down an elementary school? If you are Mosley, you keep things going. That’s why, even on Tuesday afternoon, every inch of wall space in Room 111 is still covered with hand-made posters—guides for the first graders. How to find the permimeter of a rectangle. What the main idea is. "We’ve been working on sight words--like game, make, maybe, crayon," the first graders say. "We’ve been working on compare and contrast. Summarizing. We’ve been working on our fractions. Times tables!" At the time of my visit, Bontemps has fewer than 10 more hours to live, and staff are still teaching, which the principal is proud of. But no one hides the fact that they feel closing this school is a mistake. "Close schools like this down, you’re breaking down links and you’re breaking up generational traditions. They’re forced to go to other schools where there’s no history for them behind it," says first grade teacher Felicia Kyle. "Is there anybody in this classroom whose parents went here?" she asks the class. Most hands shoot up, and kids rattle off relatives who studied in these same classrooms--moms, dads, grandmas, uncles. Right up until the last day, students ask Principal Mosley why their school is closing. "Can we save the school?" fifth grader Isaiah Conley asked Mosley when he stopped by his class Tuesday. "We tried , Isaiah," Mosley tells him. "We went to all those meetings, we went to all those public hearings, we wrote letters, but they said no." Isaiah is sitting in a chair that&apos;s just a little bit apart from everyone else in the class. It&apos;s not the corner of the room, but it kind of is. "I’m gonna miss this school, even though I’m a trouble maker," Isaiah says. "I still have feelings for this school. &apos;Cause all the staff and everybody loves me. And they always support me when I do wrong. They tell me, Don’t do it no more, and I don’t. That’s why I don’t want the school to close." Being at Bontemps in its final hours, it feels like visiting someone who’s about to die. In the library, there are three palettes of collapsed cardboard boxes. They will be opened and filled with everything in this school. Graduates have been coming back to Bontemps. Some say they just want to be in the school one last time. A girl who used to play on the basketball team came back, and asked Mosley if she could take home the trophy she helped win. Mosley pauses at the trophy case. "This is from 1989--it’s been here almost 25 years," he says. 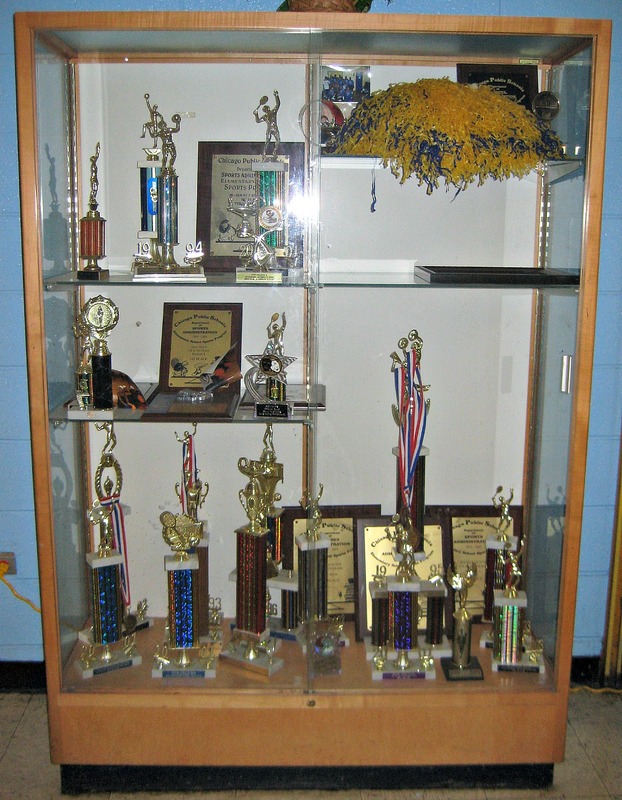 Looking at a school&apos;s trophy case is like reading a little bit of its history. Mosley names the plaques behind the glass: basketball, double Dutch, tennis, flag football, essay writing contests, science fair, the choir. This afternoon, the bell rang for the very last time at Bontemps. The unclaimed trophies, and the rest of Bontemps history, will go into boxes beginning tomorrow.